Here we offer one of the most useful magnets known to man - an incredibly powerful magnet with a hook attached. Need to hang a large display from drop ceilings? This is what you need. 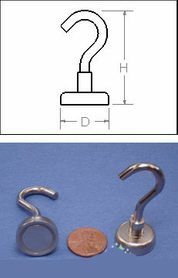 If you've ever fought to position a light for an event, beaded drapes, or anything for that matter, you understand how valuable one of these hooks could be for unrestricted placement. The possible uses for these great hook magnets are unlimited! The hook, magnet and mount are all nickel plated to resist corrosion and to provide that nice shiny, silver finish. 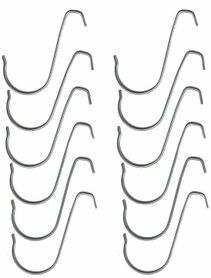 You will get a set of 2 hooks. Diameter = 1" (1.00") Height = 2 1/8" (2.125") Hook Attachment = #8-32 Threaded ; Pull Force: 40.64 lbs (this means you can hang 41 pounds from Each Hook! We have tested this hook at our facilities. It will hold up to 41 Pounds. This means if you hang more than 41 pounds from each hook, the hook will fall down. If your item is over 41 pounds and you can only hold it up from one attachment point, please choose one of our heavier hooks. Our heaviest hook can hold up to 50 pounds per hook. I bought some from another place the same time I bought from here just to compare and 1) the shipment from ShopWildThings came in much quicker than the other place and 2) I can't believe the quality difference! I tested them out at an event this weekend and they are well worth the money!!!! Love this item for hanging items from the ceiling. Merchant Response:What a great headline! I'm a cave woman, and I find them easy to use too! Thank you for your review. Come see us again soon.